French MPs who have already voted once to legalise the online sharing of music and films are to consider the matter again next week. In December they backed a move to allow internet users to download as much material as they want in exchange for a small fee. If it becomes law France would be the first country to authorise the swapping of copyrighted music. The surprise vote caused outrage among record companies and film producers, who say illegal peer-to-peer (P2P) copying costs their industries millions of euros every year. It was an embarrassing defeat for the government, which had planned to introduce large fines and possible jail terms of up to three years for internet pirates. Seventeen year old Aziz Ridouan became so angry at the number of people already being taken to court that he started up his own pressure group. Today, the Audiosurfers Association has 6,000 members. It campaigns for a change in the law and helps defend those being prosecuted. "What they were doing is something 12 million people do in France today," says Aziz. "It's not piracy simply to download to listen to music in new formats. The very principle of culture is to share it." Instead of backing the government's approach, MPs introduced an amendment which would authorise internet file-sharing by setting up a "global licence" system. When you buy something over the internet, it's exactly the same as when you are in a shop; you have to pay the cashier, and if you don't, there is an alarm. Users would pay a few euros a month to download as much music or film material as they wanted, with proceeds going to the artists. Socialist MP Patrick Bloche helped draft the amendment. He argues it makes no sense to treat several million French internet users as potential offenders. "Rather than outlawing, punishing, and paradoxically maintaining to a certain extent an illegal system," he says, "let's make a different choice: authorising peer-to-peer downloading, but in return, putting in place a system allowing artists to be paid." The idea was greeted with horror by powerful figures in French music and cinema. 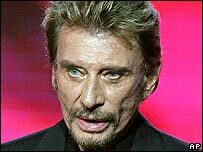 Household names such as veteran rocker Johnny Hallyday were mobilised to protest, arguing that revenue from a global licence wouldn't compensate for the millions they say they risk losing through falling CD sales. "When you buy something over the internet, it's exactly the same as when you are in a shop," insists Herve Rony of SNEP, the Syndicat National de l'Edition Phonographique which represents record companies. "You have to pay the cashier, and if you don't pay, there is an alarm". The MPs' vote in December sent the government scuttling off to redraft its bill. It has since spent two months in consultations with artists, industry representatives and internet users to try to reach a compromise. More than 13,000 musicians signed a petition in favour of the global licence. A website set up to encourage a debate on P2P copying was inundated with replies. The government's new plan still rejects the global licence, although it agrees that private copying should be allowed. The sanctions for illegal copying have been reduced considerably, with fines beginning at 38 euros (£26) for small-scale piracy. This week the debate has been fuelled by some seemingly conflicting recommendations from influential bodies. A report by the Economic and Social Council which advises parliament on new laws argued that P2P exchanges should be made legal. Meanwhile France's highest court, the Cour de Cassation, ruled there was no automatic right for consumers to make private copies of their own DVDs. As MPs prepare to vote again, backing for the global licence remains strong despite the government's opposition. At least some freeing up of online file-sharing seems inevitable - with major consequences for the music and film industries in France.